Click here to donate. 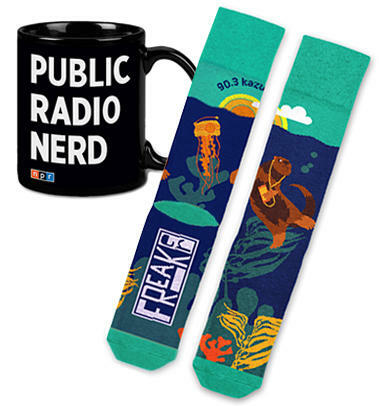 When you contribute $144 (or $12 a month), you can choose our KAZU Otter Socks and Public Radio Nerd Mug combo. The socks feature an otter cracking into Monterey Bay’s number one source for news and entertainment, 90.3 FM KAZU, and a sock-ingly bright orange nettle radio. Our friends at Freaker USA have knit this pair of cotton blend, One Size Fits Most socks for our members. Each pair is proudly manufactured in the USA.